Almost every time we read thread that attempts to evaluate Expert Advisors, an EA reviewer website or an EA seller website we realize that most people put the wrong focus in the testing of Expert Advisors. Image you enter an EA seller website or a regular Expert Advisor reviewer website, then you look at an Expert Advisor, what is the first thing they tell you? Without a doubt, the first thing most people analyze about a trading system and how most people evaluate these strategies is through the amount of profit they make in a given amount of time. In fact, the majority of Expert Advisor selling websites just focus on this aspect of trading. We have always found this to be a totally wrong approach to the evaluation of trading systems. Why is that? Because we certainly don’t care that much about profit because profit is a secondary aspect for us in trading, the most important aspect in trading for us is capital safety. That’s right. Many experienced traders and Fund Managers will agree with us in that the most important characteristic of a trading strategy is how good care it takes of your capital. We would never trade a strategy that made 50% in one month and then wiped the account 8 months later, we are not interested in taking very high risks in order to achieve high profits. As we have said, the most important thing for us is capital preservation and how the EA can trade in a conservative fashion. So what is wrong with focusing on the profits? Everything! The problem is that when you focus on the profits you ignore the chance the Automated Trading System you are trading has of wiping your account or leaving you in a very bad, deep Drawdown. What happens then? Many people trade Expert Advisors in the hope that they will get amazing profit returns when in reality these profit levels are tied to insanely high risks through unlimited or very high market exposures. Our advice is very simple. When you are examining a trading system you should know the Maximum Drawdown level it has an the mechanisms it uses to limit its market exposure. That is why you will see that we put much more focus on the reduction of Drawdown levels and the control of market exposure through dynamic Money Management Systems than we do in developing a system that can turn 500 USD into one million dollars. The question Expert Advisor creators and reviewers have to ask themselves should be reversed. It should not be, can the expert make X money? It should be, how much money can the expert make with an X maximum Drawdown? 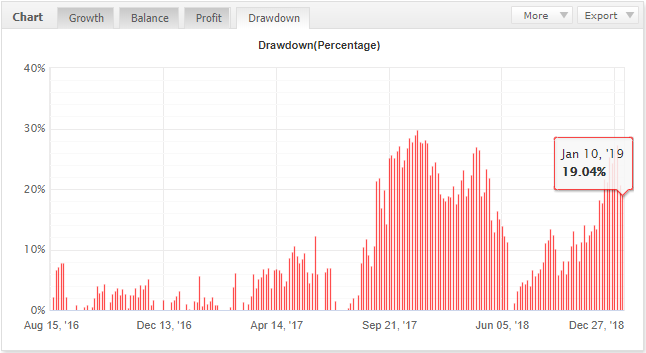 Of course, the estimation of the maximum Drawdown level of a strategy must be inferred through extensive reliable historical testing validated by live trading results. Previous Compound Interest: The slow, but sure way of making money!